Suppose a charged particle moves with a velocity v near a wire carrying an electric current. So, a magnetic force acts on it. If the same particle is seen from a frame moving with velocity v in the same direction, the charge will be found to be at rest. Will the magnetic force become zero in this frame? Will the magnetic field become zero in this frame? θ), where v is the velocity of the particle. So, when v = 0, F = 0. Magnetic field on the particles still exists because the current is independent of the frame of reference. For any reason, if the electrons of the wire seem to be at rest in a frame of reference, the protons are still flowing opposite to the frame of reference. Due to this, the current and the magnetic fields still exist. Can a charged particle be accelerated by a magnetic field? Can its speed be increased? Yes, a charged particle can be accelerated by a magnetic field. A magnetic field exerts force on the charged particle, which is perpendicular to both the magnetic field and velocity. If initially the charged particle is moving at right angle to the magnetic field, then the resultant trajectory of the particle is circular motion. In circular motion, the magnitude of the velocity remains constant but direction changes continuously. So, the motion is accelerated but speed remains constant. Will a current loop placed in a magnetic field always experience a zero force? No, it depend on the magnetic field, i.e. whether the field is a uniform or a non-uniform magnetic field and also on the orientation of the current loop. In case of a uniform magnetic field, the force on the circular loop is zero if the magnetic field is parallel to the plane of the loop and in case of a non-uniform magnetic field, the force may or may not be zero. The free electrons in a conducting wire are in constant thermal motion. If such a wire, carrying no current, is placed in a magnetic field, is there a magnetic force on each free electron? Is there a magnetic force on the wire? As the electrons are in motion, there is a magnetic force acting on them individually. But the current through the wire represents the collective motion of all the electrons that are moving or vibrating very randomly; so, overall effect is negligible. Hence there is no net magnetic force on the wire. F = ILBsin(θ)So, if the current in the wire is zero, then the force experienced by the wire will also be zero. Assume that the magnetic field is uniform in a cubical region and zero outside. Can you project a charged particle from outside into the field, so that the particle describes a complete circle in the field? Let us assume that the magnetic field is uniform and is acting along positive x axis in the cubical region. Now if we project a charged particle inside this cube along positive y axis then as the direction of velocity and magnetic field is perpendicular to each other so the resultant trajectory of the particle will be a circle. An electron beam projected along the positive x-axis deflects along the positive y-axis. If this deflection is caused by a magnetic field, what is the direction of the field? Can we conclude that the field is parallel to the z-axis? As the particle gets deflected towards the positive y-axis, we can conclude that force is acting on the particle along the positive y-axis. Now, as the electron is moving along the positive x-axis, the current can be assumed to be flowing along the negative x-axis. Applying Fleming’s left-hand rule, we find that the thumb points in the direction of force, i.e. the positive y-axis and the middle finger points in the direction of current, i.e. negative x-axis. Consequently, the forefinger gives us the direction of magnetic field, i.e. out of the plane of the paper or in the positive z-direction. So, we can conclude that the magnetic field is pointing along the positive z-axis. Is it possible for a current loop to stay without rotating in a uniform magnetic field? If yes, what should be the orientation of the loop? Yes, if the direction of the area vector coincides with the direction of the magnetic field, the torque acting on the loop due to the magnetic field will become zero. Hence, no rotation will be produced in the coil. τ = m⇀×B⇀=mBsin (θ)⇒For θ= 0 or integral multiple of π,τ =0Which implies that the coil will not rotate. The net charge in a current-carrying wire is zero. Then, why does a magnetic field exert a force on it? The net charge in a current- carrying wire is zero. Yet, negative charge, i.e. electrons are moving in the wire towards the positive terminal. It is this motion of electrons in the conductor which produces the current in the wire and is also responsible for the magnetic force acting on the wire. θ), where F is the force, q is the charge of electrons, V is the velocity of electrons and B is the magnetic field. Moreover, the positive charges on the wire are due to nucleus containing proton. As they are not moving so there is no force on them, so the force is only due to the moving electrons in the wire. The torque on a current loop is zero if the angle between the positive normal and the magnetic field is either θ = 0 or θ = 180°. In which of the two orientations, the equilibrium is stable? 180°, U is positive or the system is unstable. Stability of a system depends on its energy and every system tries to minimise its energy. The configuration of the system with least energy is most stable and the configuration with the most energy is least stable or unstable. Verify that the units weber and volt second are the same. FqVAlso, weber/mâ€‹2 is the unit for magnetic field B.
Weberm2=Fq×V⇒Weber=F×m2q×m×s-1=F×mq×s-1=Wq×s=Volt×sThus, the units weber and volt second are same. A positively-charged particle projected towards east can be considered as current in the eastern direction. Here, the positive charge is deflected towards the north by a magnetic field, i.e. the positively-charged particle experiences a force in the northern direction. Hence, in order to determine the direction of the magnetic field, we apply Fleming’s left-hand rule. According to this rule, when we stretch the thumb, the fore-finger and the middle finger mutually perpendicular to each other, then the thumb gives the direction of the force experienced by the charged particle, the fore-finger gives the direction of the magnetic field and the middle finger gives the direction of the current. Thus, if we direct the middle finger in the eastern direction, the thumb in the northern direction, we see that the fore-finger points in the downward direction. Thus, the direction of the magnetic field is found to be in the downward direction. When the charged particle is whirled in a horizontal circle, at any moment, the current direction can be taken along the tangent of the circle. Also, the magnetic field is in the vertical direction. So, using Fleming’s left-hand rule, the force can be radially outward or inward, depending on the direction of the magnetic field, i.e. either upward or downward. Also, the direction of force depends on the direction of the whirl, i.e. clockwise or anticlockwise and obviously on the charge of the particle, i.e. whether it is positive or negative. So, the correct answer is that the tension may increase or decrease. Which of the following particles will experience maximum magnetic force (magnitude) when projected with the same velocity perpendicular to a magnetic field? 90°, the only thing on which force F depends is charge q. Which of the following particles will describe the smallest circle when projected with the same velocity perpendicular to a magnetic field? When a particle moves in a magnetic field, the necessary centripetal force, for the particle to move in a circle, is provided by the magnetic force acting on the particle. qvB = mv2r ⇒ r = mvqBHere, m is the mass of the particle and v is its velocity. r∝m. And since the electron is the lightest of all the particles, it describes the smallest circle when projected with the same velocity perpendicular to the magnetic field. Which of the following particles will have minimum frequency of revolution when projected with the same velocity perpendicular to a magnetic field? f = qB2πmThe charge on all the four particles is same. But the mass is maximum for Li+. So, it will have the smallest frequency of revolution. When a circular loop is placed in a uniform magnetic field, it always experiences zero toque. We all know that a current-carrying wire experiences a force when placed in an external magnetic field. But in the case of a circular loop, forces are present in pairs, i.e. they are equal and opposite in magnitude. So, for every point on the loop, there exists another point on the diametrically opposite edge for which the force is equal and opposite to the force acting on first point. So, these two forces cancel in pair. In this way, the net torque on the loop is always zero when placed in a uniform magnetic field. -eVB, whereas on a proton this force is F = eVB. Here, ‘e‘ is the charge of the electron. So, from the above formulas, we can see that electrons and protons will experience equal force but in opposite directions; so they separate out. In other words, we can say that they are deviated by different angles and causes them to separate. θperpendicular to the magnetic field. We know that magnetic field does not change the speed of a particle; rather, it changes the direction of its velocity. So, a magnetic force acts on the particle due to the vertical component of velocity, which tries to move the particle in a circle.This force tries to rotate the particle in a circle. But as there is a horizontal component of velocity also, the particle will move helically with a constant pitch because no force acts on the particle along the direction of the horizontal component of velocity. We all know that magnetic field B does not change the speed of the particle but changes its direction. But as an electric field is also present that accelerate the particle in the direction of the field, the resultant path is a helix with a non-uniform pitch. θof the angles between velocity and magnetic field is zero. So, the force on the charged particle is zero. As the charged particle is at rest, its velocity, V = 0 and magnetic force, F = qVB = 0. Hence, we cannot determine whether a magnetic field is present or not. But as the particle at rest experiences no electromagnetic force, the electric field must be zero. This is because electric force acts on a particle whether it is at rest or in motion. As the charged particle is at rest, its velocity, V = 0 and magnetic force, F = qVB = 0. Hence, we cannot determine whether a magnetic field is present or not. But as the particle at rest experiences an electromagnetic force, the electric field must be non-zero. As electric force acts on a particle, whether it is at rest or in motion, an electric force must be present. As the particle gets deflected, a force acts on the particle. So, either it has got deflected due to the magnetic force or electric force; so, both the fields cannot be zero. Also, the particle can be deflected under the combined effect of magnetic and electric forces; so, both fields can be non-zero. A charged particle moves in a gravity-free space without change in velocity. Which of the following is/are possible? (1) E = 0, B = 0, i.e. no force is acting on the particle and hence, it moves with a constant velocity. × B = 0. Hence, the particle will not accelerate. (3) If the force due to magnetic field and the force due to electric field counterbalance each other, then the net force acting on the particle will be zero and hence, the particle will move with a constant velocity. A charged particle moves along a circle under the action of possible constant electric and magnetic fields. Which of the following is possible? The electric field exerts a force q E on the charged particle, which always accelerates (increases the speed) the particle. The particle can never be rotated in a circle by the electric field because then the radius of the orbit will keep on increasing due to the acceleration, which is not possible. So, options (c) and (d) are incorrect. On the other hand, a magnetic field does not change the magnitude of the velocity but changes only the direction of the velocity. Since the particle is moving in a circle, where its speed remains constant and only the direction of velocity changes, so it can only be achieved if E = 0 and B ≠ 0. B→In option (a) velocity, electric field and magnetic field are parallel to each other. So, the particle may accelerate but always continue to travel in the same straight path or go undeflected. Another possibility of the particle to go undeviated is that magnetic force acting on it is counterbalanced by electric force. This is possible if all the three, i.e. velocity, magnetic field and electric field are perpendicular to each other, so that magnetic force is balanced by electric force. So option (b) can also be one possibility. But (c) and (d) are wrong statements. Two ions have equal masses but one is singly-ionised and the other is doubly-ionised. They are projected from the same place in a uniform magnetic field with the same velocity perpendicular to the field. (a) Both ions will move along circles of equal radii. (b) The circle described by the singly-ionised charge will have a radius that is double that of the other circle. (c) The two circles do not touch each other. (d) The two circles touch each other. where r is the radius of the circle, m is the mass of the ion, V is the velocity with which the ion is projected, q is the charge on the ion and B is the uniform magnetic field. Since the mass m, the velocity V and the magnetic field B are same for both the ions, r is inversely proportional to the charge on the ion. Hence, the radius of the circle described by the singly-charged ion will be twice the radius of the circle described by doubly-ionised ion. Moreover, as both the charges are projected from the same place, the two circles described by them will touch each other at the point of projection. v →. Two of the following equations are wrong. Identify them. By’ = By+vEzElectric force due to a charged particle is q E and magnetic force is q V B. Hence, analysing the answers using dimensional analysis, we see that the second term on the RHS of the equations (b) and (c) are not dimensionally correct. Thus, the options (b) and (c) are wrong. An alpha particle is projected vertically upward with a speed of 3.0 × 104 km s−1 in a region where a magnetic field of magnitude 1.0 T exists in the direction south to north. Find the magnetic force that acts on the α-particle. The direction of the magnetic field is from south to north. where e is the charge of an electron. The direction of magnetic force can be found using Fleming’s left-hand rule. An electron is projected horizontally with a kinetic energy of 10 keV. A magnetic field of strength 1.0 × 10−7 T exists in the vertically upward direction. (a) Will the electron deflect towards the right or left of its motion? (b) Calculate the sideways deflection of the electron while travelling through 1 m. Make appropriate approximations. The direction of magnetic field is vertically upward. (a) The direction can be found by the right-hand screw rule. So, the electron will be deflected towards left. As there is no force acting on the electron in the horizontal direction, the velocity of the electron remain constant in this direction. j→) × 10−10 N on a particle with a charge of 1.0 × 10−9 C and going in the x−y plane. Find the velocity of the particle. As per the question, the charge is going in the X-Y plane. i→in the last expression was not readable. What can this number be? We have denoted the unidentified number as x. So, the dot product of the two quantities should be zero. x=217=3Acceleration of the particle is (3i + 7j) × 10−6 m/s2. A 10 g bullet with a charge of 4.00 μC is fired at a speed of 270 m s−1 in a horizontal direction. A vertical magnetic field of 500 µT exists in the space. Find the deflection of the bullet due to the magnetic field as it travels through 100 m. Make appropriate approximations. y = 12at2= 12×4.00×10-6×270×500×10-610×10-3×1002702= 3.7×10-6 m.
When a proton is released from rest in a room, it starts with an initial acceleration a0 towards west. When it is projected towards north with a speed v0, it moves with an initial acceleration 3a0 towards west. Find the electric field and the maximum possible magnetic field in the room. The initial acceleration of a proton, when it is released from rest, is a0 towards west. Here, q is the charge, E is the electric field and m is the mass. When the proton is projected towards north with a speed v0, it moves with an initial acceleration 3a0 towards west. where B is the magnetic field. ⇒B=F→qv0Again, an electric force will act on the proton in the west direction, due to which, an acceleration a0 will act on the proton.Now, as the proton was initially moving with a velocity v, a magnetic force is also acting on the proton.So, the change in acceleration of the proton will be solely due to the magnetic force acting on it. Consider a 10-cm long portion of a straight wire carrying a current of 10 A placed in a magnetic field of 0.1 T making an angle of 53° with the wire. What magnetic force does the wire experience? The direction of force can be found using Fleming’s left-hand rule. Therefore, the direction of magnetic force is perpendicular to the wire as well as the magnetic field. A current of 2 A enters at the corner d of a square frame abcd of side 20 cm and leaves at the opposite corner b. A magnetic field B = 0.1 T exists in the space in a direction perpendicular to the plane of the frame, as shown in the figure. Find the magnitude and direction of the magnetic forces on the four sides of the frame. The direction of magnetic field is perpendicular to the plane of the frame, coming out of the plane. 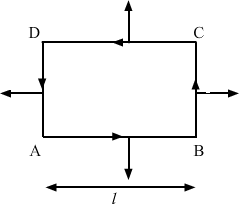 As per the question, current enters at the corner d of the square frame and leaves at the opposite corner b. Thus, the direction of magnetic force is towards the left. Thus, the direction of magnetic force is downwards. A magnetic field of strength 1.0 T is produced by a strong electromagnet in a cylindrical region of radius 4.0 cm, as shown in the figure. A wire, carrying a current of 2.0 A, is placed perpendicular to and intersecting the axis of the cylindrical region. Find the magnitude of the force acting on the wire. The direction of magnetic field is perpendicular to the plane of the wire. B→=B0(i→+j→+k→)T. Find the magnitude of the magnetic force acting on the wire. As per the question, the current is passing along the X-axis. 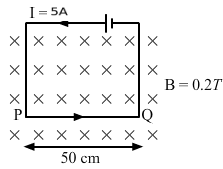 A current of 5.0 A exists in the circuit shown in the figure. The wire PQ has a length of 50 cm and the magnetic field in which it is immersed has a magnitude of 0.20 T. Find the magnetic force acting on the wire PQ. The direction of magnetic field is perpendicular to the plane of the frame and it is going into the plane of the circuit. Thus, the direction of magnetic force is upwards in the plane of the paper. A circular loop of radius a, carrying a current i, is placed in a two-dimensional magnetic field. The centre of the loop coincides with the centre of the field (figure). The strength of the magnetic field at the periphery of the loop is B. Find the magnetic force on the wire. Therefore, the magnetic field points radially outwards. Direction of the force can be found using Fleming’s left-hand rule. Thus, the direction of magnetic force is perpendicular to the plane of the figure and pointing inside. e→rdenotes the unit vector along the radial direction. A circular loop of radius a, carrying a current i, is placed with its plane parallel to the x−y plane and the centre at (0, 0, d). Find the magnitude of the magnetic force acting on the loop. e→rdenotes the unit vector along the radial direction. As per the question, the loop is placed with its plane parallel to the X−Y plane and its centre is at (0, 0, d). Here, angle between the length of the loop and the magnetic field is θ. A rectangular wire-loop of width a is suspended from the insulated pan of a spring balance, as shown in the figure. A current i exists in the anti-clockwise direction in the loop. A magnetic field B exists in the lower region. Find the change in the tension of the spring if the current in the loop is reversed. Direction of the current is anti-clockwise. Direction of the magnetic field is into the plane of the loop. F →= ia→×B→The magnetic force will act only on side AD and BC. F→ = ia→×B→ = iaBsinθ = iaBDirection of force can be found using Fleming’s left-hand rule. Thus, the direction of the magnetic force is upward. = iaB − (− iaB) = 2iaB. A current loop of arbitrary shape lies in a uniform magnetic field B. Show that the net magnetic force acting on the loop is zero. Let the electric current flowing through the loop be i. Length of each side of the loop is l.
Assume that the direction of the current is clockwise. Direction of the magnetic field is going into the plane of the loop. Direction of force can be found using Fleming’s lef- hand rule. So, F1 and F2 cancel each other. So, F3 and F4 cancel each other. Therefore, the net force acting on the arbitrary loop is 0. Prove that the force acting on a current-carrying wire, joining two fixed points a and b in a uniform magnetic field, is independent of the shape of the wire. Let the electric current flowing through the wire be i.
F→=il→×B→F→=ilBsinθLet us consider two wires of length l, one straight and the other circular. i2πaB = ilBBoth the forces are equal in magnitude. This implies that the magnetic force is independent of the shape of the wire and depends on the length and orientation of the wire. Therefore, the magnetic force is independent of the shape of the wire. A semicircular wire of radius 5.0 cm carries a current of 5.0 A. A magnetic field B of magnitude 0.50 T exists along the perpendicular to the plane of the wire. Find the magnitude of the magnetic force acting on the wire. y=A sin2πλx.A magnetic field B exists in the z direction. Find the magnitude of the magnetic force on the portion of the wire between x = 0 and x = λ.
y=A sin2πλxMagnetic field (B) exists in the z direction. We have to find the magnetic force on the portion of the wire between x = 0 and x = λ.
dF→=idl×B→The effective force on the whole wire is equivalent to the force on a starlight wire of length λ placed along the x axis. A rigid wire consists of a semi-circular portion of radius R and two straight sections (figure). The wire is partially immersed in a perpendicular magnetic field B, as shown in the figure. Find the magnetic force on the wire if it carries a current i. As per the question, the wire is partially immersed in a perpendicular magnetic field. So, the magnetic force on the wire PQ and the force on the wire RS are equal and opposite to each other. Both the forces cancel each other. Therefore, only the semicircular loop PR will experience a net magnetic force. A straight horizontal wire of mass 10 mg and length 1.0 m carries a current of 2.0 A. What minimum magnetic field B should be applied in the region, so that the magnetic force on the wire may balance its weight? 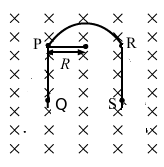 Figure shows a rod PQ of length 20.0 cm and mass 200 g suspended through a fixed point O by two threads of lengths 20.0 cm each. A magnetic field of strength 0.500 T exists in the vicinity of the wire PQ, as shown in the figure. The wires connecting PQ with the battery are loose and exert no force on PQ. (a) Find the tension in the threads when the switch S is open. (b) A current of 2.0 A is established when the switch S is closed. Find the tension in the threads now. Two metal strips, each of length l, are clamped parallel to each other on a horizontal floor with a separation b between them. A wire of mass m lies on them perpendicularly, as shown in the figure. A vertically-upward magnetic field of strength B exists in the space. The metal strips are smooth but the coefficient of friction between the wire and the floor is µ. A current i is established when the switch S is closed at the instant t = 0. Discuss the motion of the wire after the switch is closed. How far away from the strips will the wire reach? Let the distance covered by the wire be x. Due to the presence of the magnetic field, a net magnetic force will act on the wire towards the right. Let the wire has moved through a distance x after travelling the length of the strips. As the contact between the wire and strip is smooth so coefficient of friction between them is zero. Under the influence of magnetic force,firstly the wire will travel a distance equal to the length of the strips. After this, it travels a distance x and also now,a frictional force will act on the wire in a direction opposite to its direction of motion. So we can equate the work done by the magnetic force and the frictional force. A metal wire PQ of mass 10 g lies at rest on two horizontal metal rails separated by 4.90 cm (figure). A vertically-downward magnetic field of magnitude 0.800 T exists in the space. The resistance of the circuit is slowly decreased and it is found that when the resistance goes below 20.0 â„¦, the wire PQ starts sliding on the rails. Find the coefficient of friction. A straight wire of length l can slide on two parallel plastic rails kept in a horizontal plane with a separation d. The coefficient of friction between the wire and the rails is µ. If the wire carries a current i, what minimum magnetic field should exist in the space in order to slide the wire on the rails? The minimum magnetic field that should exist in the space, in order to slide the wire on the rails, should be such that the net magnetic force acting on the wire is equal to the frictional force on the wire. The figure shows a circular wire loop of radius a and carrying a current i, which is placed in a perpendicular magnetic field B. (a) Consider a small part dl of the wire. Find the force on this part of the wire exerted by the magnetic field. (b) Find the force of compression in the wire. Using Fleming’s left-hand rule, we can say that the direction of magnetic force is towards the centre for any small element of length dl of the wire (dl and B are perpendicular to each other). Suppose that the radius of cross-section of the wire used in the previous problem is r. Find the increase in the radius of the loop if the magnetic field is switched off. Young’s modulus of the material of the wire is Y.
Young’s modulus of the material of the wire is Y. As per the question, when the applied magnetic field is switched off, the tension in the wire increased and so did its length. B→=B01+xlk→. A square loop of edge l and carrying a current i, is placed with its edges parallel to the x−y axes. Find the magnitude of the net magnetic force experienced by the loop. As per the question, the loop is placed with its edges parallel to the X−Y axes. In the figure, arrow denotes the direction of force on different sides of the square. Consider a small element of length dx at a distance x from the origin on line AB. Force on AB will be acting downwards. A conducting wire of length l, lying normal to a magnetic field B, moves with a velocity v, as shown in the figure. (a) Find the average magnetic force on a free electron of the wire. (b) Due to this magnetic force, electrons concentrate at one end, resulting in an electric field inside the wire. The redistribution stops when the electric force on the free electrons balances the magnetic force. Find the electric field developed inside the wire when the redistribution stops. (c) What potential difference is developed between the ends of the wire? As the wire is moving with velocity v, we can consider this as the net motion of electrons inside the wire with velocity v.
= e(v × B) = evB, where e is the charge of an electron. (b) The redistribution stops when the electric force is just balanced by the magnetic force. V = lE = lvB, where V is the potential difference across the ends of the wire. 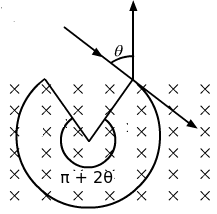 A current i is passed through a silver strip of width d and area of cross-section A. The number of free electrons per unit volume is n. (a) Find the drift velocity v of the electrons. (b) If a magnetic field B exists in the region, as shown in the figure, what is the average magnetic force on the free electrons? (c) Due to the magnetic force, the free electrons get accumulated on one side of the conductor along its length. This produces a transverse electric field in the conductor, which opposes the magnetic force on the electrons. Find the magnitude of the electric field which will stop further accumulation of electrons. (d) What will be the potential difference developed across the width of the conductor due to the electron-accumulation? The appearance of a transverse emf, when a current-carrying wire is placed in a magnetic field, is called Hall effect. i = vnAe, where e = charge of an electron and v is the drift velocity. v = inAe(b)The magnetic field existing in the region is B. (c) Let us take the electric field as E.
So, further accumulation of electrons will stop when the electric force is just balanced by the magnetic force. A particle of charge 2.0 × 10−8 C and mass 2.0 × 10−10 g is projected with a speed of 2.0 × 103 m s−1 in a region with a uniform magnetic field of 0.10 T. The velocity is perpendicular to the field. Find the radius of the circle formed by the particle and also the time period. Uniform magnetic field, B = 0.10 T.
As per the question, the velocity is perpendicular to the field. So, for the particle to move in a circle,the centrifugal force to the particle will be provided by the magnetic force acting on it. A proton describes a circle of radius 1 cm in a magnetic field of strength 0.10 T. What would be the radius of the circle described by an α-particle moving with the same speed in the same magnetic field? We know that the charge of a proton is e and that of an alpha particle is 2e. Also, the mass of a proton is m and that of an aplha particle is 4m. Suppose, both the particles are moving with speed v.
An electron of kinetic energy 100 eV circulates in a path of radius 10 cm in a magnetic field. Find the magnetic field and the number of revolutions per second made by the electron. Protons with kinetic energy K emerge from an accelerator as a narrow beam. The beam is bent by a perpendicular magnetic field, so that it just misses a plane target kept at a distance l in front of the accelerator. Find the magnetic field. As per the question, the beam is bent by a perpendicular magnetic field. A charged particle is accelerated through a potential difference of 12 kV and acquires a speed of 1.0 × 106 m s−1. It is then injected perpendicularly into a magnetic field of strength 0.2 T. Find the radius of the circle described by it. As per the question, a charged particle is injected perpendicularly into the magnetic field. Doubly-ionised helium ions are projected with a speed of 10 km s−1 in a direction perpendicular to a uniform magnetic field of magnitude 1.0 T. Find (a) the force acting on an ion (b) the radius of the circle in which it circulates and (c) the time taken by an ion to complete the circle. A proton is projected with a velocity of 3 × 106 m s−1 perpendicular to a uniform magnetic field of 0.6 T. Find the acceleration of the proton. As per the question, the proton is projected perpendicular to a uniform magnetic field. (a) An electron moves along a circle of radius 1 m in a perpendicular magnetic field of strength 0.50 T. What would be its speed? Is it reasonable? (b) If a proton moves along a circle of the same radius in the same magnetic field, what would be its speed? r = meveBeve = rBeme, where me is the mass of the electron and ve is the speed of the electron. =1×0.50×1.6×10-199.1×10-31≈8.8×1010 m/sSince, the speed of the electron moving along the circle is greater than the speed of light, it is not reasonable. r = mpvpBevp = rBemp,where mp is the mass of the proton and vp is its speed. A particle of mass m and positive charge q, moving with a uniform velocity v, enters a magnetic field B, as shown in the figure. (a) Find the radius of the circular arc it describes in the magnetic field. (b) Find the angle subtended by the arc at the centre. (c) How long does the particle stay inside the magnetic field? (d) Solve the three parts of the above problem if the charge q on the particle is negative. As per the question, the particle is projected into a perpendicular magnetic field. mv2qBWidth of the region in which a magnetic field is applied is half of the radius of the circular path described by the particle. The acceleration along the x direction is zero. The force will act only along the y direction. 2mvqBFrom the figure, it can be seen that the angle between the initial direction and final direction of velocity is π. 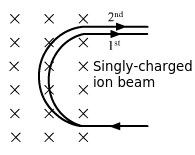 A narrow beam of singly-charged carbon ions, moving at a constant velocity of 6.0 × 104 m s−1, is sent perpendicularly in a rectangular region of uniform magnetic field B = 0.5 T (figure). It is found that two beams emerge from the field in the backward direction, the separations from the incident beam being 3.0 cm and 3.5 cm. Identify the isotopes present in the ion beam. Take the mass of an ion = A(1.6 × 10−27) kg, where A is the mass number. Separations between the two beams from the incident beam are 3.0 cm and 3.5 cm. where m1 is the mass of the first isotope and q is the charge. where m2 is the mass of the first isotope and q is the charge. A2 = 76A1=76×12.5=14.58 uSo, the two isotopes of carbon used are 12C6 and 14C6. Fe+ ions are accelerated through a potential difference of 500 V and are injected normally into a homogeneous magnetic field B of strength 20.0 mT. Find the radius of the circular paths followed by the isotopes with mass numbers 57 and 58. Take the mass of an ion = A (1.6 × 10−27) kg, where A is the mass number. Mass numbers of the two isotopes are 57 and 58.
r = mvqBFor isotope 1,r1 = m1v1qBFor isotope 2,r2 = m2v2qB⇒r1r2 =m1v1m2v2As both the isotopes are accelerated via the same potential V, the K.E gained by the two particles will be same. A narrow beam of singly charged potassium ions of kinetic energy 32 keV is injected into a region of width 1.00 cm with a magnetic field of strength 0.500 T, as shown in the figure. The ions are collected at a screen 95.5 cm away from the field region. If the beam contains isotopes of atomic weights 39 and 41, find the separation between the points where these isotopes strike the screen. Take the mass of a potassium ion = A (1.6 × 10−27) kg, where A is the mass number. Atomic weights of the two isotopes are 39 and 41. As per the question, the narrow beam of singly-charged potassium ions is injected into a region of magnetic field. We know that throughout the motion, the horizontal velocity remains constant. = 25.4 × 10−9 sec. The figure shows a convex lens of focal length 12 cm lying in a uniform magnetic field B of magnitude 1.2 T parallel to its principal axis. A particle with charge 2.0 × 10−3 C and mass 2.0 × 10−5 kg is projected perpendicular to the plane of the diagram with a speed of 4.8 m s−1. The particle moves along a circle with its centre on the principal axis at a distance of 18 cm from the lens. Show that the image of the particle moves along a circle and find the radius of that circle. As per the question, the object is projected perpendicular to the plane of the paper. Let the radius of the circle on which the object is moving be r.
1v-1u = 1f,1v-1-18 = 112Image distance, v = 36 cm. Let the radius of the circular path of image be r‘. vu = r’rr’ = vu×r=8 cmTherefore, the radius of the circular path in which the image moves is 8 cm. Let the mass of an electron be m and the charge of an electron be e.
T=2πmeBAs the acceleration of the electron is along the y axis only, it travels along the x axis with uniform velocity. Velocity of the electron moving along the field remains v.
Two particles, each with mass m are placed at a separation d in a uniform magnetic field B, as shown in the figure. They have opposite charges of equal magnitude q. At time t = 0, the particles are projected towards each other, each with a speed v. Suppose the Coulomb force between the charges is switched off. (a) Find the maximum value vm of the projection speed, so that the two particles do not collide. (b) What would be the minimum and maximum separation between the particles if v = vm/2? (c) At what instant will a collision occur between the particles if v = 2vm? (d) Suppose v = 2vm and the collision between the particles is completely inelastic. Describe the motion after the collision. Both the particles have equal charges in magnitude but opposite polarity equal to q. As per the question, both the particles are projected towards each other with equal speed v.
It is assumed that Coulomb force between the charges is switched off. Let the radius of the curved path taken by the particles, when they are projected with speed vm/2, be r.
The particles will collide at a distance d/2 along the horizontal direction. Let they collide after time t.
Velocity of the particles along the horizontal direction will remain the same. Let the particles collide at point P.
And at point P, both the particles will have motion in upward direction. As the collision is inelastic they stick together. Velocity along the horizontal direction does not get affected due to the magnetic force. At point P, velocities along the horizontal direction are equal and opposite. So, they cancel each other. Velocity along the vertical direction (upward) will add up. v’=0+a×tv’=0+2qvmBm×m2qBv’=vmHence, both the particles will behave as a combined mass and move with velocity vm. A uniform magnetic field of magnitude 0.20 T exists in space from east to west. With what speed should a particle of mass 0.010 g and with charge 1.0 × 10−5 C be projected from south to north so that it moves with uniform velocity? gravitational force experienced by the particle should be equal to the magnetic force experienced by the particle. So, qvB = mg, where v is the uniform velocity and g is the acceleration due to gravity. A particle moves in a circle of diameter 1.0 cm under the action of a magnetic field of 0.40 T. An electric field of 200 V m−1 makes the path straight. Find the charge/mass ratio of the particle. Electric field, E = 200 V m−1. As per the question, the particle is moving in a circle under the action of a magnetic field. But when an electric field is applied on the particle, it moves in a straight line. qE = qvB, where q is the charge and v is the velocity of the particle. As per the question, the proton is not deflected under the combined action of the electric and magnetic fields. Thus, the forces applied by both the fields are equal and opposite. But when the electric field is switched off, the proton moves in a circle due to the force of the magnetic field. A particle with a charge of 5.0 µC and a mass of 5.0 × 10−12 kg is projected with a speed of 1.0 km s−1 in a magnetic field of magnitude 5.0 mT. The angle between the magnetic field and the velocity is sin−1 (0.90). Show that the path of the particle will be a helix. Find the diameter of the helix and its pitch. v∥=vcosθSince there are no forces in the horizontal direction (the direction of magnetic field), the particle moves with uniform velocity. 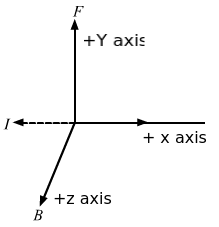 The velocity has a vertical component along which it accelerates with an acceleration a and moves in a circular cross-section. Thus, it moves in a helix. Find the speed of the particle as a function of its z-coordinate. So, az = qE0mv2=u2+2as = 2qE0mzSo, v=2qE0 zmHere, z is the distance along the z-direction. A rectangular coil of 100 turns has length 5 cm and width 4 cm. It is placed with its plane parallel to a uniform magnetic field and a current of 2 A is sent through the coil. Find the magnitude of the magnetic field B if the torque acting on the coil is 0.2 N m−1. A 50-turn circular coil of radius 2.0 cm carrying a current of 5.0 A is rotated in a magnetic field of strength 0.20 T. (a) What is the maximum torque that acts on the coil? (b) In a particular position of the coil, the torque acting on it is half of this maximum. What is the angle between the magnetic field and the plane of the coil? Here, A is the area of the coil and θ is the angle between the area vector and the magnetic field. τ is maximum when θ = 90°. A rectangular loop of sides 20 cm and 10 cm carries a current of 5.0 A. A uniform magnetic field of magnitude 0.20 T exists parallel to the longer side of the loop. (a) What is the force acting on the loop? (b) What is the torque acting on the loop? Let ABCD be the rectangular loop. (a) There is no force on the sides ab and cd, as they are along the magnetic field. But the force on the sides ad and bc are equal and opposite; so, they cancel each other. Hence, the net force on the loop is zero. Here, A is the area of the coil and θ is the angle between the area vector and magnetic field. So, the torque acting on the loop is 0.02 N-m and is parallel to the shorter side. A circular coil of radius 2.0 cm has 500 turns and carries a current of 1.0 A. Its axis makes an angle of 30° with the uniform magnetic field of magnitude 0.40 T that exists in the space. Find the torque acting on the coil. Here, A is the area of the coil. A circular loop carrying a current i is made of a wire of length L. A uniform magnetic field B exists parallel to the plane of the loop. (a) Find the torque on the loop. (b) If the same length of the wire is used to form a square loop, what would be the torque? Which is larger? Circumference, L = 2πr, where r is the radius of the coil. τ = niABsinθ, where θ is the angle between the area vector and the magnetic field. τ = niAB = iL2B4π(b) Let s be the length of the square loop. 4s = L ⇒s = L4A = L42 = L216τ = niAB = iL2B16So, the torque on the circular loop is larger. A square coil of edge l and with n turns carries a current i. It is kept on a smooth horizontal plate. A uniform magnetic field B exists parallel to an edge. The total mass of the coil is M. What should be the minimum value of B for which the coil will start tipping over? μ=q2 ml, where l is the angular momentum of the ring about its axis of rotation. where I is moment of inertia of the ring about its axis of rotation. where I is the moment of inertia of the ring about its axis of rotation. Considering the strip of width dx at a distance x from the centre of the sphere.